I am so, so sorry for your loss. You're in my thoughts. Oh, Maggie, I am so sorry to hear this. Soak up all that Eastern N.C. goodness, and be buoyed in all ways by your family and good memories (and barbecue sauce. Obviously.) Much love to you. His wonderfulness kind of jumps right off the page, doesn't it? Oh Maggie, I'm so sorry to hear this. Losing a grandparent is so tough, especially when it's someone who brings you as much joy as he obviously did. My thoughts are with you. Maggie, I'm so so sorry for your loss. He sounds like an absolutely amazing man. My thoughts and prayers are with you and your family. Oh Maggie, I am so sorry for your loss. 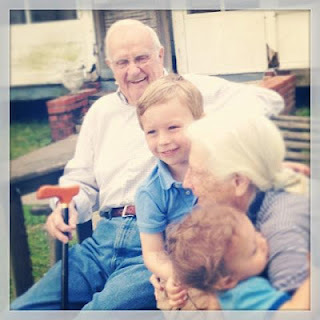 It is so hard to lose grandparents. My thoughts are with you. I'm so sorry Maggie. But it sounds like he was a well loved family man, who will have all of those family members celebrating his life this weekend. Thinking of y'all, and have a safe trip down to NC. Maggie, I'm so sorry to hear about your grandfather. Sounds like he lived a wonderful life. Love the thought of your grandparents reunited in their rocking chairs! I hope your time at home with family helped heal your heart a little. It's so hard to lose a grandparent.